Percy Pig says Get Baking! 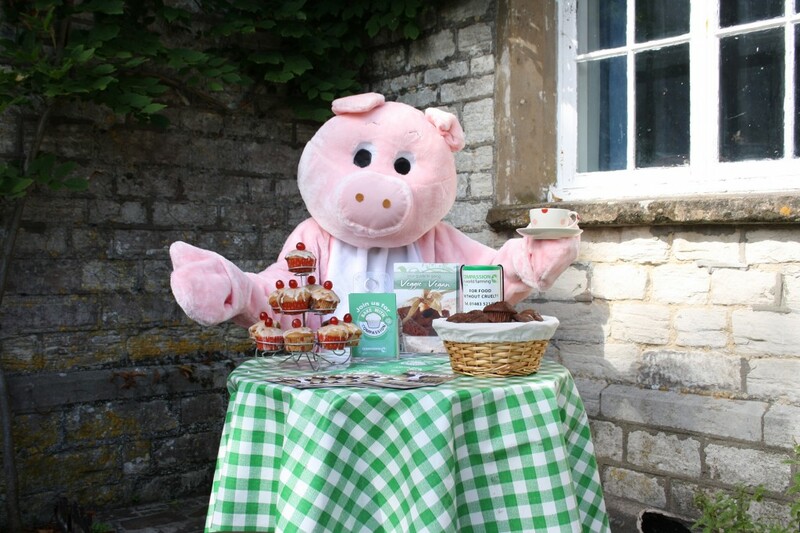 Members from my local animal welfare group Compassionate Dorset who support Dorset Energized, are celebrating BAKE WITH COMPASSION MONTH throughout October (with 14th – 20th October also being the UK’s National Baking Week), starting with our popular annual vegan cake sale in Dorchester town centre on Saturday 5th October where you can meet Percy the Free-Range Pig! Bake With Compassion is the leading farm animal welfare charity Compassion in World Farming‘s annual event to raise awareness and funds to end the suffering caused by factory farming and celebrate ethical, higher welfare produce including organic, and to reduce the unsustainable demand for meat and dairy. Compassion’s current major campaign ‘Project Pig’ is fighting to end the suffering of millions of Europe’s pigs following recent investigations into pig farming in Spain, Italy and Ireland where they found shocking widespread maltreatment of pigs enduring terrible conditions. The UK alone also consumes over 30 million eggs per day. Although the barren battery cage was banned in the EU on January 1st 2012, the use of ‘enriched’ cages remains legal. Enriched colony cages house 60-80 hens with each hen only having space around 20% larger than an A4 piece of paper. Nest boxes, litter, perch space and ‘claw shortening devices’ must be provided but they are still very restrictive, the hens cannot fly up to a high perch to be safe from feather pecking. The litter area is often very limited and effective dust-bathing isn’t possible, so the hens are far from free-range. In fact, currently half of our eggs in the UK are still not free-range. I reckon that everyone loves a cake and taking cakes into work or school, baked with free-range, high welfare, or even vegan ingredients, is a great opportunity to bring people together, have fun and to raise awareness and vital funds for Compassion. Some of our group members have previously held their own Tea Parties for family or friends with one member April Walker-Bambury holding a Compassionate Tea Party with her pupils at Leweston School in Sherborne. Royal Veterinary College PhD student Sophie Collins hosted her own Come Dine With Me dinner party with her friends in Weymouth, and Laura Hodgson and Sue Loveless are putting on a meat-free day at work in Briantspuddle on alternate Fridays to raise funds. My fellow Compassionate Dorset Co-founder Sandra Hood from Crossways, who is an NHS Diabetes Specialist Dietician and previously ran the 2011 London Marathon in aid of the charity and carried the Olympic Flame through Milborne St Andrew in 2012, held a Nutritional Cooking Workshop for last years’ Bake With Compassion with fellow Dietitian Sarah Smith, and is running the cake sale in Dorchester on the 5th. Compassionate Dorset have found that many consumers are often confused about what they are buying as packaging does not always make it clear where food has come from. Compassion in World Farming believe that consumers have the right to know what they are eating, so for this year’s Bake With Compassion they are linking up with the ‘Labelling Matters’ campaign and encouraging bakers to inspect labels to ensure that the ingredients they bake with are higher-welfare. We would love to hear from anyone who does want to host their own bake event or send us their compassionate baking photos, or maybe people can ask their local village hall or church to provide coffee, cake and chat for a Compassionate Coffee Morning. Cafes, canteens or food businesses could use more free-range ingredients or put on a special dish for the month – it could even put them on the way to winning a Good Farm Animal Welfare Award! One of my clients in my work as a Web Designer (hence my involvement with Dorset Energized as their Web Designer and Web Manager), Dorset business The Gilded Teapot who source and sell fine and rare speciality loose teas and fair trade coffees in their Dorchester shop in the Tudor Arcade, will be promoting Bake With Compassion throughout October, collecting donations for the charity and recommending the perfect teas to accompany your compassionate cakes. Compassionate Dorset supporter Paul Fairman is also running the first ever full marathon at The Bournemouth Marathon Festival for Compassion on Sunday 6th (find out more on www.compassionatedorset.co.uk/animal-welfare-dorset-news.htm) plus Compassionate Dorset will be hosting a film night on Saturday 19th October in West Stafford Village Hall which will see the remarkable story of a maverick organic dairy farmer and his unruly cows come to Dorset for a special screening of the British documentary film everyone is talking about – ‘The Moo Man’! Remember eating more ethically and sustainably is just one way you can help our planet whilst feeling good! Check out Dorset Energized’s pages on Sustainable Living and Energy Efficiency for more tips or look at the Renewable Energy options available to us all here in Dorset.